Out of thousands of stocks that are currently traded on the market, it is difficult to identify those that will really generate strong returns. Hedge funds and institutional investors spend millions of dollars on analysts with MBAs and PhDs, who are industry experts and well connected to other industry and media insiders on top of that. Individual investors can piggyback the hedge funds employing these talents and can benefit from their vast resources and knowledge in that way. We analyze quarterly 13F filings of nearly 750 hedge funds and, by looking at the smart money sentiment that surrounds a stock, we can determine whether it has the potential to beat the market over the long-term. Therefore, let’s take a closer look at what smart money thinks about MGM Resorts International (NYSE:MGM). MGM Resorts International (NYSE:MGM) was in 46 hedge funds’ portfolios at the end of the fourth quarter of 2018. MGM has experienced a decrease in hedge fund sentiment recently. There were 49 hedge funds in our database with MGM positions at the end of the previous quarter. Our calculations also showed that MGM isn’t among the 30 most popular stocks among hedge funds. We’re going to review the recent hedge fund action encompassing MGM Resorts International (NYSE:MGM). How have hedgies been trading MGM Resorts International (NYSE:MGM)? At Q4’s end, a total of 46 of the hedge funds tracked by Insider Monkey were long this stock, a change of -6% from one quarter earlier. 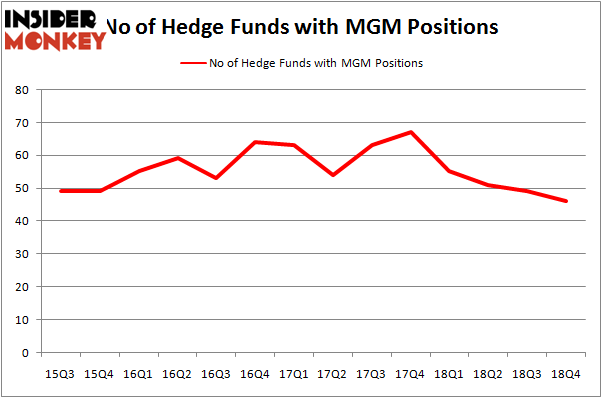 The graph below displays the number of hedge funds with bullish position in MGM over the last 14 quarters. With the smart money’s capital changing hands, there exists an “upper tier” of key hedge fund managers who were boosting their holdings considerably (or already accumulated large positions). 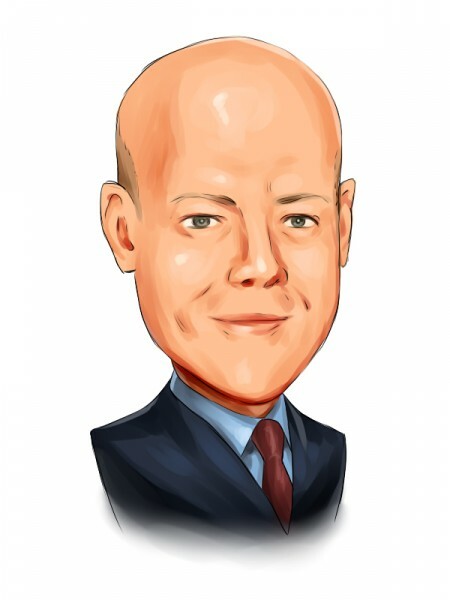 According to Insider Monkey’s hedge fund database, Joshua Friedman and Mitchell Julis’s Canyon Capital Advisors has the biggest position in MGM Resorts International (NYSE:MGM), worth close to $513.4 million, accounting for 12.1% of its total 13F portfolio. Sitting at the No. 2 spot is Keith Meister of Corvex Capital, with a $204.5 million position; the fund has 7.6% of its 13F portfolio invested in the stock. Remaining peers with similar optimism encompass John Overdeck and David Siegel’s Two Sigma Advisors, Jonathon Jacobson’s Highfields Capital Management and Mario Gabelli’s GAMCO Investors. Due to the fact that MGM Resorts International (NYSE:MGM) has witnessed bearish sentiment from hedge fund managers, it’s easy to see that there lies a certain “tier” of fund managers that decided to sell off their full holdings by the end of the third quarter. Intriguingly, Parag Vora’s HG Vora Capital Management said goodbye to the largest position of all the hedgies tracked by Insider Monkey, valued at about $181.4 million in stock. Matthew Sidman’s fund, Three Bays Capital, also said goodbye to its stock, about $59.7 million worth. These moves are intriguing to say the least, as aggregate hedge fund interest dropped by 3 funds by the end of the third quarter. Let’s go over hedge fund activity in other stocks similar to MGM Resorts International (NYSE:MGM). We will take a look at Coca-Cola FEMSA, S.A.B. de C.V. (NYSE:KOF), Laboratory Corp. of America Holdings (NYSE:LH), Yum China Holdings, Inc. (NYSE:YUMC), and Huntington Bancshares Incorporated (NASDAQ:HBAN). This group of stocks’ market valuations are closest to MGM’s market valuation. As you can see these stocks had an average of 24.5 hedge funds with bullish positions and the average amount invested in these stocks was $494 million. That figure was $1590 million in MGM’s case. Laboratory Corp. of America Holdings (NYSE:LH) is the most popular stock in this table. On the other hand Coca-Cola FEMSA, S.A.B. de C.V. (NYSE:KOF) is the least popular one with only 6 bullish hedge fund positions. Compared to these stocks MGM Resorts International (NYSE:MGM) is more popular among hedge funds. Considering that hedge funds are fond of this stock in relation to its market cap peers, it may be a good idea to analyze it in detail and potentially include it in your portfolio. Our calculations showed that top 15 most popular stocks among hedge funds returned 19.7% through March 15th and outperformed the S&P 500 ETF (SPY) by 6.6 percentage points. Unfortunately MGM wasn’t in this group. Hedge funds that bet on MGM were disappointed as the stock returned 7.8% and underperformed the market. If you are interested in investing in large cap stocks, you should check out the top 15 hedge fund stocks as 13 of these outperformed the market.